Product information "Sofia - 100 Years the Capital of Bulgaria. Quality - BU"
The obverse depicted Bulgaria coat of arms. In the outer circle of the coin has an inscription “Peoples Republic of Bulgaria”, the nominal value of 20 leva and the year of issue – 1979. The reverse side depicted the portrait of Ulpia Serdica. 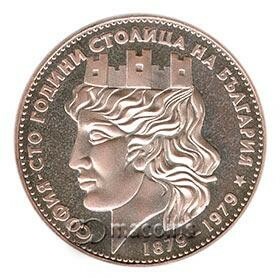 In the outer circle of the coin has an inscription “Sofia - One hundred years the capital of Bulgaria" and the years "1879 - 1979". Edge: embossed text "Sofia: Ever Growing; Never Old"
Related links to "Sofia - 100 Years the Capital of Bulgaria. Quality - BU"